I'm going to go back to something I tried a long time ago, where I give impressions of a show in three stages, instead of going by each episode. The Alpha stage will cover initial thoughts while watching the show, Beta will cover the middle, and of course Omega the final thoughts. To get back in the groove of things, I'll start with a show that is only 8 episodes long, and also a previous subject of this very blog: Black Rock Shooter. First of all a little background. 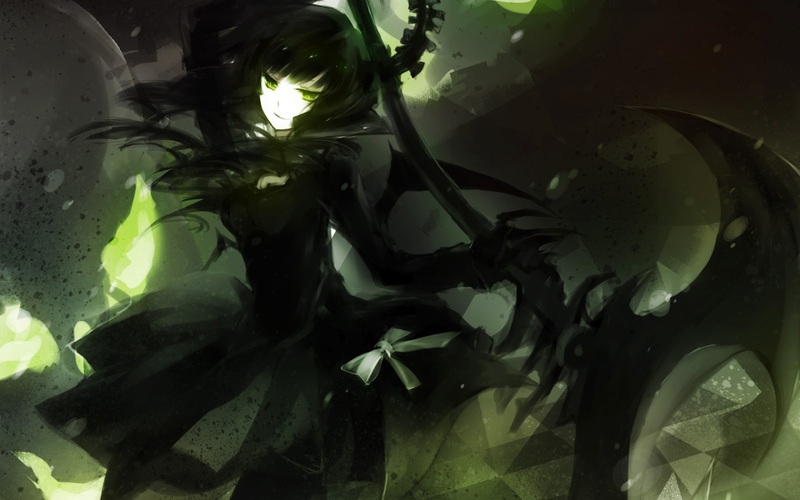 For my feelings on the Black Rock Shooter franchise you can check out a previous article I wrote called "What I want (wish) out of Black Rock Shooter." Since that article was written, what I wanted has more or less come true. There are a couple of BRS manga (not counting the beaucoup and beaucoup of doujin), a couple of video games, an OVA and an anime, and all of them have different plots... for the most part. The two most similar are the OVA and the Anime series, obviously because they share the same creative staff. I was not impressed with the BRS OVA at all. It seemed like a pretty bland concept, with boring characters, no explanation, and no emotional tie to anything going on. The idea in a nutshell (or I assume as it is never stated) is that there are two worlds and one of them is like the world we all live in and deal with our real world problems, and the other world everyone just fights. There is never any explanation as to how the two worlds connect. You can kind of infer that the girl that looks like Black Rock Shooter in the real world (Kuroi) and the girl that looks like Dead Master in the real world (Yomi), when they interact, their fighting counterparts engage in battle. But there never seems to be any rhyme or reason to it. 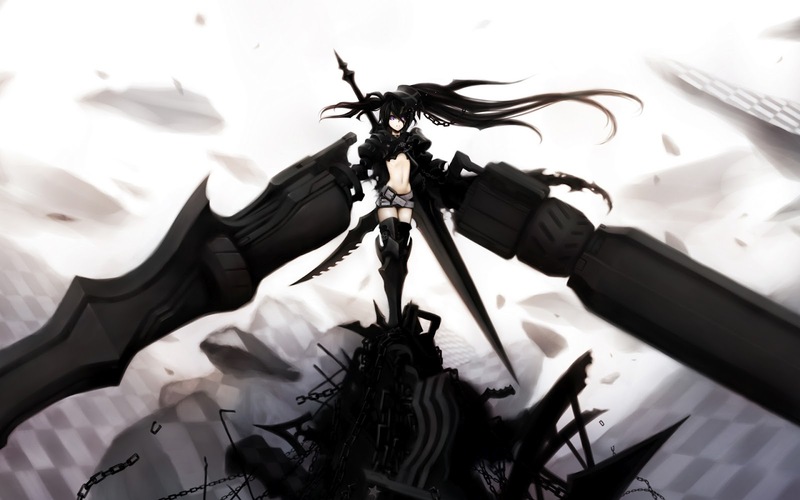 In fact, by the end I'm more convinced that the Black Rock Shooter world is the future and they will do battle for all eternity. Who knows? There is no information given to the audience to explain any of it. It was a sloppy mess. Really the OVA's only purpose was to drum up enough interest in the idea to support the development of a TV show. I found the OVA to be such a poor spectacle, that I hardly felt any excitement when the TV show was eventually announced. 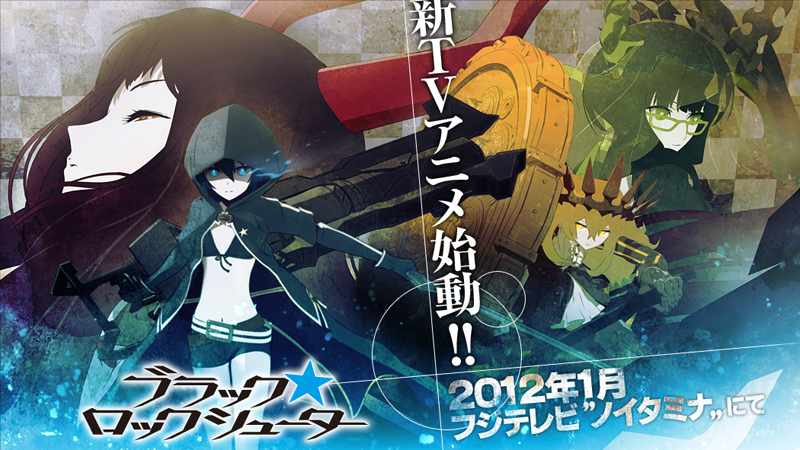 Like most people, my interest in Black Rock Shooter comes from huke's character designs. There is something about the designs, that you just want to see them in something awesome. So then, the trailer for the TV show came out to try and get people excited again, and then what little interest I had in it dipped even further. The character designs changed for nearly every character! At least that was how it seemed from the trailer. The twintails that Black Rock Shooter was known for, were now covered up by a hoodie. Dead Master looked like the crazy cat lady who chased you off her lawn when you were 8. And Black Gold Saw, my personal favorite of all of huke's creations, looked like a blonde girl with wheels for feet. At that point I pretty much wrote off the entire show without seeing a single episode. But as time went on, and the show started, and I would sit at my desk and look at all my beautiful Black Rock Shooter Figmas, it was only a matter of time before my mind was like, "Hey just give the first episode a shot. It won't hurt anything." So I did, and now I can say, being only two episodes in, I'm hooked. What I find the most perplexing is; how come, in only one episode of the TV show, with an airtime of almost 30 minutes, I care way more about these characters than I did in the 45 minute OVA? Kuroi is a whole lot easier to relate to, and she has this wide eyed optimism that you just want to see her succeed, but damn it seems like everything and everyone is against her. This is where the show shines, and what the OVA was missing. With the character of Kagari, a sickly girl who keeps Yomi at her beck and call, you instantly feel Kuroi's pain and humiliation when Kagari berates her in front of her new friend, Yomi. I think every person has been in Kuroi's shoes at some point in their life, and because of that, I felt a bond grow between myself and Kuroi, which I never felt in the OVA. And speaking of bonds, there is also the bond between all the main characters and the other world, the more familiar Black Rock Shooter characters. Also, unlike the OVA, there is a clear connection between what is happening in the other world and the human world. While in the first two episodes, nothing has really been explained as to what the other world is, the connection between the two worlds is very clear as for every action in the human world, has a clear metaphor battle in the other world. This is what really captured my attention. As a video editor by day, I have an appreciation for good editing. The OVA failed in editing in about every way imaginable. Shots were too long, the cutting was haphazard, and I never knew what I was supposed to be looking at any given time. Why all of a sudden did we cut to the Black Rock Shooter world? If the characters aren't telling me, then the visual storytelling should be doing that. But it didn't. 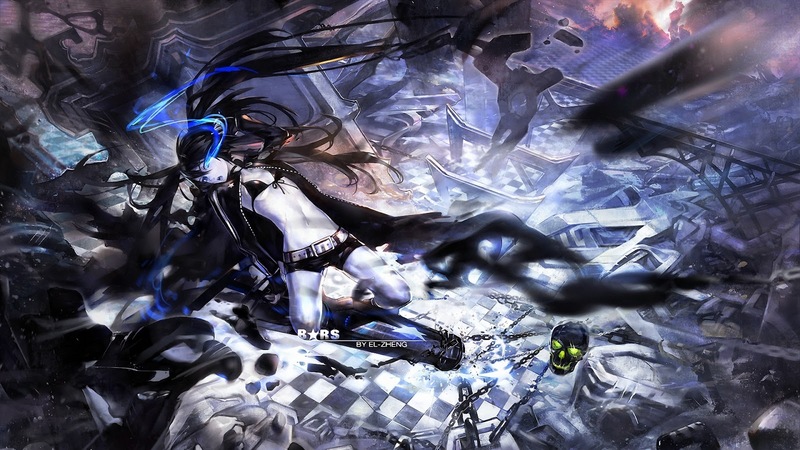 The BRS anime by comparison has some of the best editing I've seen in modern anime. By the end of the second episode, the first storyline arc comes to a head, and is culminated in a back and forth between the human world and the other world. While the high school character girls are all having an emotional verbal back and forth fight in the hospital, their other world counterparts are having a physical battle. But the editing of the two worlds back and forth make both worlds seem like they are part of the same battle. The point in particular is when Kagari is yelling in hysterics at Yomi trying to get her attention and screams "Why are you smiling? 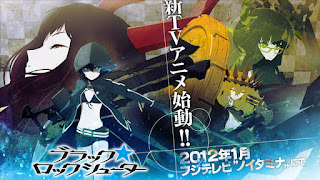 ", then it cuts to Black Rock Shooter's actions in the other world and we see her fighting to free the imprisoned Dead Master. It makes it seem like she is smiling because of what it happening in the other world, and I think that is partly true, but then we cut back to the hospital and Kagari is saying, "Are you smiling, because she called you Yomi?" It's like a double hitter as far as the emotional impact, and I know I'm not doing the scene any justice by describing it. But it is very effective in what it is trying to accomplish. Which brings me another observation that really impressed me with the show. I think one of the major criticisms to a lot of action anime is there is no real weight when characters are involved in fight scenes. The fights are always these flashy over the top spectacles which look really good when you see them in trailers and in music videos. However when it is tied to a story, it seems these characters are invincible while being thrown into a wall or getting stabbed or tossed off a fifty foot building and walking away. There is nothing ever stated as to why characters can take so much punishment and not die. It's the same reason I've never like Superman. Too powerful and not enough vulnerability. 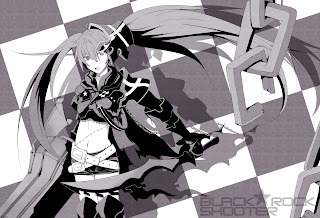 If Black Rock Shooter were just composed of the other world segments, then it would easily fall into this stereotype. BRS herself is stabbed by a giant metal crab at the end of the first episode, with her blue electric blood flying everywhere, and is seemingly fine in the next episode. But the writers decided to turn this concept on its ear. The vulnerabilities of the characters are shown in the human world. Their weaknesses are the human avatars they are tied to. They are all powerful Gods in the other world, and can do their flashy moves and pull chain guns out of midair and look badass doing it, but in the human world they are just human and that effects them in both directions. So instead of seeing Black Rock Shooter in a sticky situation and thinking, "she's not going to make it out of this," instead it is the moments in the human world where you think, "ah poor Kuroi is going to be hated forever". But that feeling only works because of what you witness Black Rock Shooter do. I understand it's confusing, and it's hard to explain, other then just saying I felt a new kind emotional experience that was unique. While it seems, so far, no one is aware of the connection people have with this other world, the draw of Kuroi's character is that she is starting to get the connection, and has used information she learned in the other world to help her human world self. Likewise, in this battle in the hospital, Black Rock Shooter used information from the human world to help her win (or at least it is implied. BRS is a silent protagonist so far). 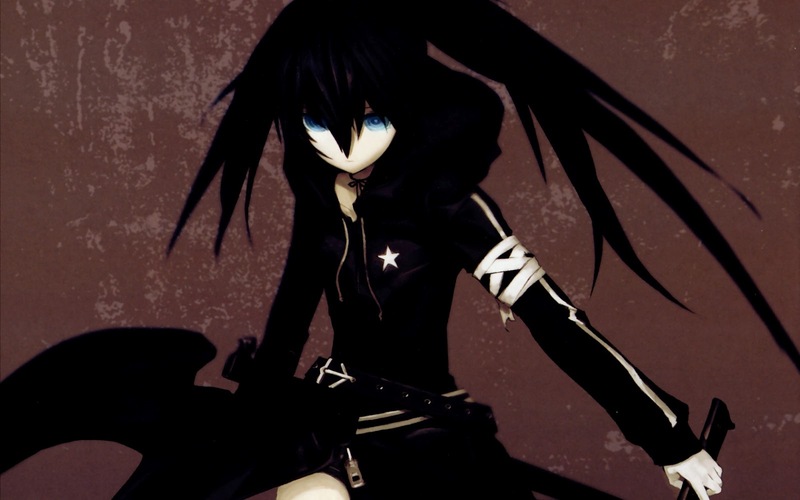 It gives both Kuroi and BRS a slight advantage in their own lives to get ahead of their challenges. It's what they were trying to accomplish in the OVA but failed, but here they master it beautifully. Then the big shocker at the end, just when you think everything in the human world is matching up with the other world, with Dead Master and Black Rock standing together against the defeated Chariot, and Kuroi and Yumi are standing against Kagari. BAM! Black Gold Saw shows up in the other world and just screws up everything. She takes Dead Master away and give Chariot extra power. But in the human world Black Gold Saw doesn't have a human avatar represented. So everything I thought I knew about what was happening between these two worlds just got demolished. Again, it worked beautifully. It also confirms that the other world isn't just a dream world happening in Kuroi's head. Something else sinister is in the works. Also this would be a good time to mention that my worry for the earlier character design modifications, has also been mostly eliminated. 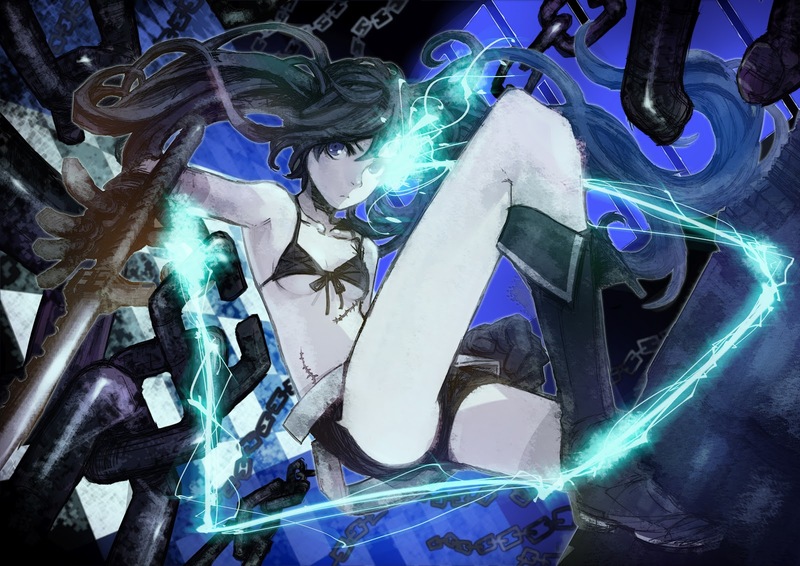 Black Rock Shooter looks just like she should with her twin tails. She fights a lot of the times with her hood up, but that is okay as it makes the moments where she puts it down all the more awesome. The character I thought was Black Gold Saw was Chariot. Black Gold Saw looks exactly the same, which couldn't make me any happier. Dead Master still looks like an old school marm. My only hope is that by the end of the series she takes off the glasses and veil and looks more like the younger, cuter, Dead Master. I won't hold my breath though. So I think it is pretty apparent I have been really impressed with just the first two episodes of the series. If the OVA had consisted of just these two episodes I would be happy, but now I have six more episodes to look forward to. I only hope it can build on the momentum they have already started.